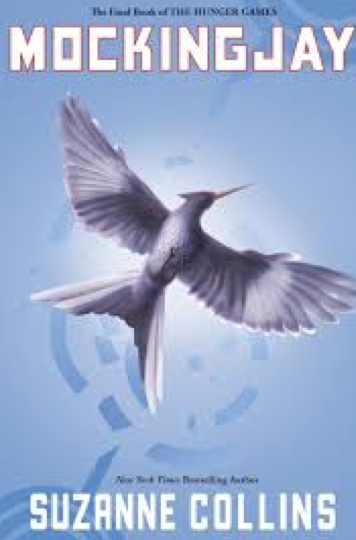 I have to admit I was looking forward to reading MOCKINGJAY, but when I picked it up it didn't hook me right away. See, I didn't read Book #2 of the series (no one assigned it to me, lol, plus I saw the movie) so seeing all these weird names (Beetee?) without faces and context left me thirsty, so I kept putting the book down. Anyway I had exams to grade, a puppy to walk, a puppy to take pictures of while she sleeps, and a puppy to stare at while holding the book and not reading it. I have mom stuff to do, anyway, Katniss can wait. I take the kids to Petsmart to Target to Publix and the new Ariana Grande/Iggy Azalea song comes on the radio, the super hip one about having "one less problem without you" and I tell Zoe that Katniss would dedicate this song to Snow. She giggles but doesn't agree but tells me to just finish the book already. Fine, fine I will. After this, that, and cleaning up after this and that also. Then in class on Wednesday I mention I hadn't finished the book yet and Nick shouts from the back, "Seriously? That's a 4 hour book!" I knew exactly what he meant. I was spending too much time reading a few pages, doing something else, coming back, lather rinse repeat. So after school Wednesday I had the pleasure of taking my kids to play somewhere that was not under my feet and once I got home to the quiet house I made a reading place for myself in the kitchen corner by the window (yoga mat, yoga ball, wall = heaven) and committed to finish the book. An hour later Zoe texts me. Please Mom, can you drive over here and bring us this? And that? And also this, that and the other which should be on her floor in a corner. Yes, yes, I write back. After I read a few more chapters. And hour later I text her OHHH NO and ask if what I think happened happened. She texts back a sad face. Asks when I'm coming. I write back PEEETA WON"T LET ME and put my phone on silent. The second half of the book reads 10x faster than the first half. I can't put it down, and I can see why some people will be sobbing their hearts out at the movie. The book didn't make me cry but I'm looking forward to watching the 2 Movies that are being made from this one book. With that done, I'm ready for Book #54, MOONWALKING WITH EINSTEIN:The Art and Science of Remembering Everything by Joshua Foer.